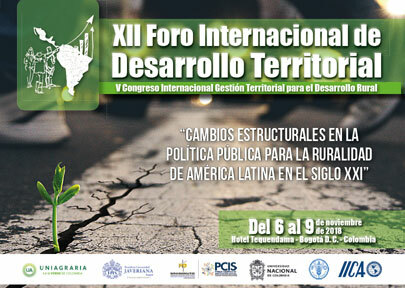 COLOMBIA: On November 8, the XII International Forum of Territorial Development opened in Bogotá on the 6th. The Forum was organized by IICA, the European Union, the United Nations Organization for Food and Agriculture (FAO), the Uniminuto University Corporation, the Pontificia Universidad Javeriana de Bogotá, the National University of Colombia, the Brazilian Network of the Research and Management in Territorial Development (RETE), the Network of Territorial Management of Rural Development of Mexico (Network GTD), and the Network for the Territorial Management of Sustainable Rural Development (Network GTD PAZ). The Forum started with a plenary session on the opening day that was introduced by the Director General of the Inter-American Institute for Cooperation on Agriculture (IICA), Manuel Otero and a a dialogue round table in which participated the Mexican Senator Beatriz Paredes, president of the Science and Technology Commission of the Senate of Mexico, Giancarlo Canzanelli, President of ILS LEDA (Global Network of Economic Development Agencies), as an expert of the European Union, and the Spanish political scientist Mercedes Peña Domingo, associate specialist of Extreme Events Institute of the International University of Florida (United States) . The Forum ended up with the recommendation to the Latin American governments to orient public policy towards more effective policies that promote territorial development as the main focus for rural development, peace and social cohesion. ILS LEDA also participated in the seminar of the European Union on the "Territorial Approach for Local Development to guide public policies" on the 7th in which the experience of ILS LEDA was recovered in focusing on participatory governance, the formulation of strategies of competitive, sustainable and inclusive development, and the role of the Local Economic Development Agencies as irreplaceable implementing entity. ILS LEDA was also convened by the National Planning Directorate of the Government of Colombia and Red Adelco to help design the public policy for territorial economic development, and invited to advise on it in the future.